The stunning GLA Class SUV is the latest to enter the automobile market. It is available in petrol and diesel versions. Mercedes Benz GLA CDI 200 Style is their diesel trim powered by a 2.1-litre mill that is based on a DOHC valve configuration. This engine is mated with a 7-speed dual clutch automatic transmission gear box. It has a plush internal cabin that is loaded with many sophisticated aspects. Some of these include a three spoke multifunction steering wheel, 60:40 split foldable rear seat, air conditioning unit and an advanced infotainment system with a touchscreen display. Coming to the exteriors, the front fascia has a stylish headlight cluster, which surrounds the bold radiator grille. The side profile includes an elegant set of 18 inch alloy wheels, while its rear end has a roof spoiler, LED tail lamps and a bumper. It has a disc braking mechanism, which is quite reliable, whereas its electro mechanical power steering system makes handling quite easier. This trim is bestowed with a number of safety aspects like tyre pressure monitoring system, electronic stability program, electronic immobilizer, adaptive high beam assist and many others. This SUV faces tough competition from Audi Q3, BMW X1and Volvo V40 Cross Country in the market. It is blessed with an eye catching outer appearance that is further enhanced with some remarkable aspects. Starting with the front facade, it has a bold radiator grille with two louvers that are painted in silver. It is flanked by a bright headlight cluster that is equipped with bi-xenon headlamps and turn indicators. The windscreen is made of green tinted glass and integrated with a couple of intermittent wipers. The bumper includes a wide air intake section, while a protective cladding is fitted beneath it. There are a few expressive lines on its sleek bonnet, which further adds to its appearance. The side profile is quite stunning with aspects like door handles, roof rails and outside rear view mirrors with LED side turn indicators. There are a stylish set of 18 inch, 5-twin spoke alloy wheels that are fitted to its wheel arches. These rims are further covered with 235/50 R18 sized tubeless radial tyres, which provide an excellent grip on roads. Its rear end is designed with a radiant tail light cluster with LED lamps, a pair of fog lamps and a wide windshield. It also has an expressive boot lid and twin exhaust pipes that adds to its appearance. 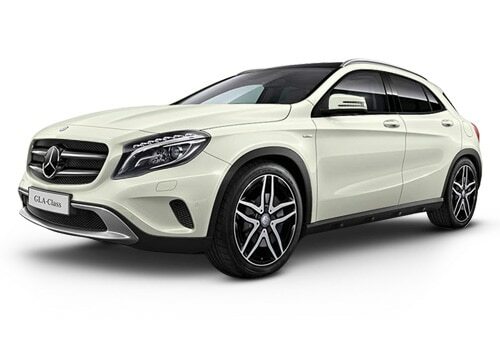 This Mercedes Benz GLA Class CDI 200 Style trim has a spacious cabin that is packed with many sophisticated aspects. The dashboard is elegantly designed and equipped with a three spoke steering wheel, center console and a stylish instrument cluster that displays various notifications. It has well cushioned seats that are covered with black ARTICO upholstery. The front seats have 4-way lumbar support, while the rear seat has 60:40 split folding facility. The cabin also includes black floor mats with embroidered Mercedes Benz lettering on it. Besides these, it has some storage spaces as well as utility based aspects that adds to their convenience. The boot space of 421 litres can be further increased up to 1235 litres by folding the rear seat. This particular variant is fitted with a 2.1-litre diesel engine, which comes with a displacement capacity of 2143cc . It is skillfully coupled with an advanced 7-speed automatic gear box with dual clutch transmission, which transmits the engine power to its front wheels. This motor is integrated with a common rail based direct injection fuel supply system, which allows it to return a maximum mileage of around 17.7 Kmpl under standard driving conditions. This diesel mill has the ability to churn out a peak power of 134bhp in the range of 3600 to 4400rpm along with a maximum torque output of 300Nm between 1600 to 3000rpm. This SUV has the ability to attain a top speed of 205 Kmph, which is rather incredible for this segment. At the same, it can cross the speed mark of 100 Kmph in nearly 9.9 seconds from a standstill. This variant is blessed with a robust suspension mechanism, which is capable for off-roading. On the other hand, its advanced braking mechanism is further assisted by ABS along with brake assist system , which has brake servo assistance. It also has anti slip regulation (ASR), electronic stability program (ESP) with curve dynamic assist, hill start assist and electric parking brake. Its front and rear wheels are further fitted with a set of disc brake. Its speed sensitive power steering system, which makes it easy to handle even in peak traffic conditions. This steering wheel supports a minimum turning radius of 11.84 meters. The company has given this luxurious sports utility vehicle an ergonomic central controller along with a 14.7-inch touchscreen infotainment system. This music system supports CD player, MP3/WMA/AAC player, dual tuner along with Bluetooth connectivity. It has a USB interface in the center armrest for external audio devices. Its leather wrapped multifunctional steering wheel is mounted with audio, cruise and call control buttons. The efficient air conditioning unit has rear AC vents along with dust and pollen filter. Apart from these, it is also equipped with cruise control with SPEEDTRONIC variable speed limiter, rear parking sensors along with reverse camera, speed sensitive volume control, ECO start/stop function, ASSYST maintenance interval indicator, driver seat with memory package, heated rear window with timer, trip computer in multifunctional display and retractable load compartment cover. This Mercedes Benz GLA Class CDI 200 Style variant is bestowed with a number of advanced safety aspects. It has seven airbags, automatic door locking with emergency opening, central locking with interior switch and crash sensor, an advanced electronic immobilizer, which safeguards the vehicle from theft and seat occupancy sensor for front co-passenger. It has 3-point seat belts for all five seats with audible warning notification on instrument panel. It also has belt tensioners with force limiters for all seats. This variant is bestowed with ISOFIX child seat attachment points in the rear. Then there are adjustable head restraints, adaptive high beam assist, tyre pressure monitoring system and infrared remote control with visible locking verification signal. Apart from these, it is also bestowed with ESP with anti slip regulation, attention assist function, crash responsive emergency lighting, ISOFIX child seat mounting and brake pad wear indicator. 1. Engine performance and acceleration is remarkable. 2. Advanced safety and comfort aspects. 1. Presence of service stations can be improved. 2. Absence of panoramic sunroof.